A friend from the US was visiting Hyderabad. He had a day free and was open to spending it any which way. I had recently read the travelogue on the Chinese Buddhist monk Huen Tsang’s visit to India and was still in awe of his 19000 mile journey in search of Buddhist manuscripts and places all through from China to India. HuenTsang had visited Amaravati in Andhrapradesh. It is ~270 kms from Hyderabad but we would need more than a day to visit that place. A closer place, ~170 kms from Hyderabad would be NagarjunaKonda (Nagarajuna Hill). I knew that Nagarjuna was a great Buddist monk and teacher and that the Nagarjunasagar Dam, where the NagarjunaKonda is located, was named after him. We decided that we would start early to NagarjunaKonda and come back before it was late- i hate to drive at night because the hi-beam light used by almost every vehicle is blinding making it difficult to spot the road ahead. Our meeting point was Kachiguda railway station. I was there by 5:45 a.m. His father dropped him at around 6.00 a.m. We started right away and after a few minutes of driving i found that i had already lost the direction. Both of us were new to the city roads. We asked for direction a couple of times and were soon on the Sagar road. This road lead to Nagarjunasagar dam hence the name Sagar road.. We halted on the way for a cup of tea and then for breakfast. Three and a half hours later we were at the Nagarjunasagar dam. It has a large reservoir with plenty of water but not enough for the gates to release it. We wanted to drive over the dam but a policeman (or was he a soldier?) stopped us. It was restricted area. Just then we saw two motorbikes coming out of the dam-driveway! We complained. Apparently, they were irrigation staff! Really?! The signpost at the dam showed directions to Ethipothala and Anupu. No sign for Nagarjunakonda! Ethipothala has a waterfall and Anupu an Archaelogical museum. We decided to go to Ethipothala that was 8 kms away. After a while we had to get off the main road into a narrow road to Ethipothala where we paid for the vehicle fee/tax. At Ethipothala there is a government park that encloses the view point for the waterfall. We bought tickets to the park and walked by the fencing along the edge of a hillock that gives a complete view of the water fall. It is a cascade waterfall. It was a magnificent view, though water was flowing only at one end of the width of the Chandravanka river. In its full glory it would be a sight to behold. The Chandravanka river is a tributary to the Krishna (on which the dam is built) but it is wider than one would imagine a tributary to be. It is no wonder that the reservoir of the dam can hold an island of the size of Nagarjunakonda. While at the view point, we asked the park cleaner if there was a way we could actually go over the waterfall or some place near where we could wet or feet. Apparently there was none and he also warned us of the danger of Crocodiles. We tried spotting the crocodiles for a while but in vain. We drove back towards the dam and asked a passer-by for directions to Nagarjunakonda. A few more kilometers on a winding road down hill and then up hill and we were at the place where we could buy tickets for a boat ride (referred to as launch) to Nagarjunakonda. Along the way different people gave us different timings for the launch. Some said the last launch was at 2 p.m. However, on reaching we found that there are no launch timings per se. The launch will run as long as there are enough tourists to fill up the seats. NagarjunaKonda is 14 kms from the launch site and it takes 45 minutes to reach. The ticket for the launch is Rs. 90 and for the museum on NagarjunaKonda is Rs. 20. NagarjunaKonda is well maintained-it looks clean with lawns everywhere and a proper road map. 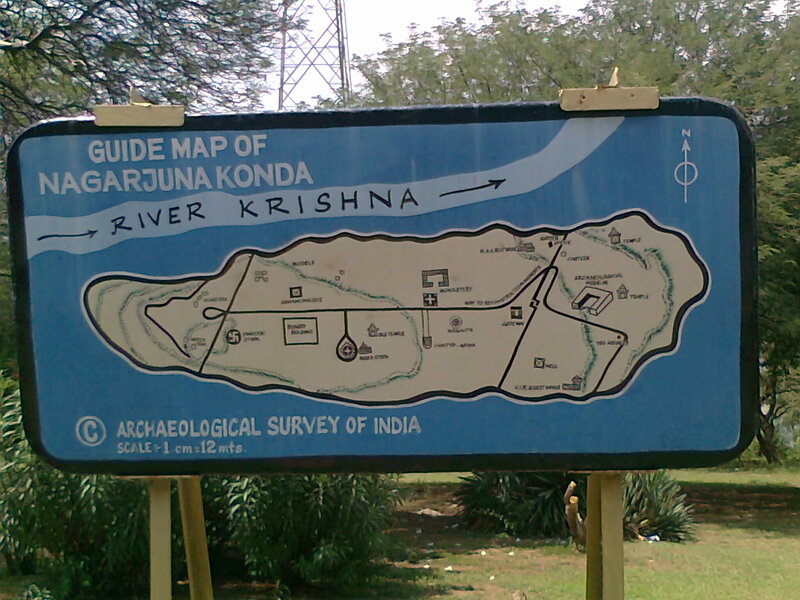 However, as is typical of the Archaeological Survey of India (ASI) they put up boards claiming that the property (monument) belonged to them but no board giving details of the history of the monument. So, without a guide this place serves just as a place to walk around and imagine what the monuments were or what their purpose/role in the society of those days or as most tourists used it : just a playground for kids. 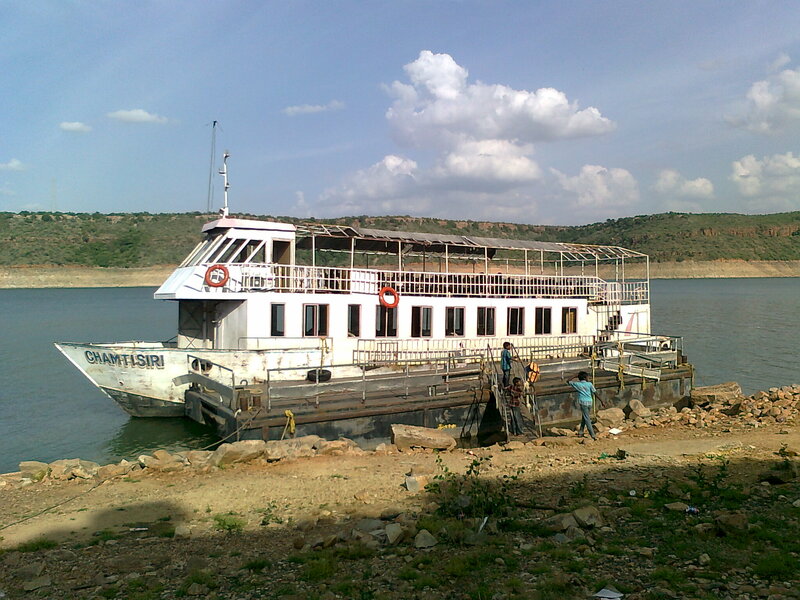 The catchment area of the Nagarjunasagar Dam consisted of several archaeological sites including the ancient city/town Vijaypuri. The town has been in existence since at least the 2-3rd Century A.D. Before the dam water submerged the place the ASI carried out excavations and collected sculptures, structures and stored them in museums at Nagarjuna Konda and Anupu. Some of the structures were rebuilt on NagarjunaKonda. NagarjunaKonda was a hill as the name Konda indicates. However, after the dam was built the river water submerged nearly half the hill and now it stands as an island. The museum atop the hill is full off sculptures predominantly in limestone depicting events in the Buddha’s life and more. If only there was a guide who could take us on a tour of the museum explaining things. I did find to my great satisfaction a book by the ASI on NagarjunaKonda available for sale at Rs. 20. The book is not voluminous and satisfies the curiosity of a casual reader as well as someone who wants dates and details. Front cover of the book on NagarjunaKonda. 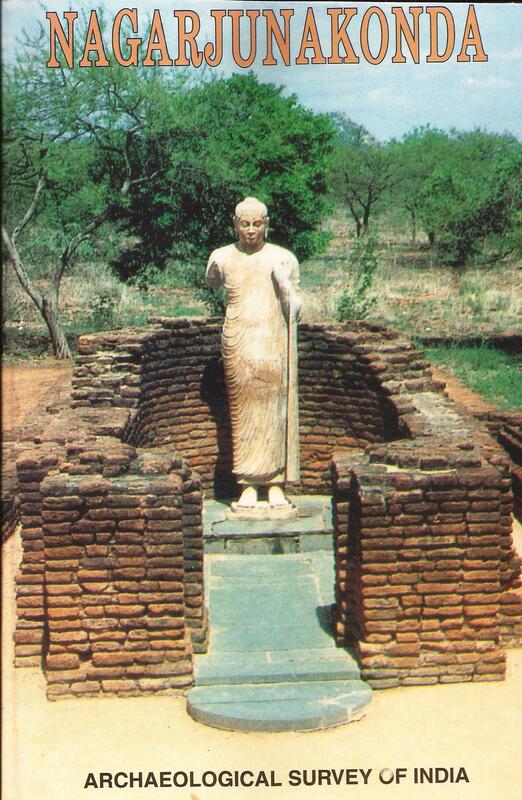 The Buddha in the picture can be see in Nagarjunakonda along with several other sculptures. I found it shockingly interesting that the archaeologists did not find any literature or artefact to explain the association of Nagarjuna with the hill/valley. So why did any one bother to name the hill after him. No one knows who did name the hill. It is an open question! We also get to know from the book that both Buddhist and Brahmanical traditions co-existed in the hill/valley. Interestingly, many of the Kings professed Brahmanical tradition while the Queens were either Buddhists or were inclined to Buddhism. I would recommend this book to anyone who wants to carry some meaning into his tour of NagarjunaKonda. Without a tour guide its practically not possible to appreciate the importance of NagarjunaKonda. We spent about 2 hours on NagarjunaKonda and were exhausted mostly because of the blazing sun. Fortunately, there is a canteen on NagarjunaKonda just behind the museum that offers tiffins and cold drinks. Vegetable pulav made from the Priya- ‘ready to cook’ packets was also available. The launch was ready by the time we reached the river. It took about half an hour to fill up all the seats and we were in my Car in about an hour. On the way back we stopped, not far from the dam, at the Hotel Siddharth and good NorthIndian food. We just had one more stop for tea at Ibrahim Patnam before reaching Hyderabad. I had started the trip early with the thought that I would avoid driving at night but i ended up driving among hi-beam lights of cars, buses and trucks on a divider-less road! I reached home at 10 p.m. My friend took an autorikshaw back home.